As baby develops during your pregnancy, the weight presses on your cervix. This leads to opening of the cervix before the arrival of pregnancy due date and without any labor or contractions. This situation is referred to as incompetent cervix or weakened cervix, which again lead to premature delivery or miscarriage. Though, incompetent cervix occurs in only 1 out of 100 pregnancies. 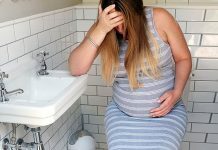 Generally, this condition happens during the early part of the second trimester, but sometimes as late as in the early third trimester. Usually, this condition is not checked in your pregnancy until after a 2nd or 3rd trimester miscarriage has occurred. A pregnant woman can be evaluated before or during her early pregnancy with the help of ultrasound, if any factors that lead to the incompetent cervix. Your physician performs the diagnosis with an ultrasound or with pelvic examination. Usually, ultrasound helps to detect the opening of the cervix or with the cervix length. About 1-2 percent of pregnancies, there is a chance to occur incompetent cervix. During the 2nd trimester, about 25% of babies will die due to this condition. 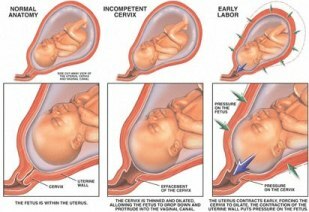 The procedure used to treat the incompetent cervix is cervical cerclage. This is performed during 14-16 weeks of pregnancy. The stitches will be removed between 36-38 weeks in order to prevent any risks at the time of labor. Usually, these risks are very rare and most of the practitioners consider cervical cerclage as a safe and life saving procedure for incompetent cervix. I had a miscarriage at 21 weeks 3 days due to cervical incompetance. The baby was born alive, but due to prematurity and lack of lack of lung growth could not survive greater than 2 hours. 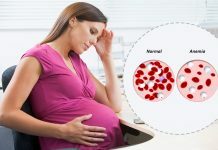 This was my first pregnancy and I had no clue until I started passing bright red blood and clots. It’s a terrible loss and I miss my baby so much that my heart breaks each time I think of him. Please take proper precautions no matter what stage of pregnancy and make sure you ask your doctor to check you thoroughly…I wish I had done this. I MISS MY BABY. I understand your pain as I lost one my twins at 21 weeks due to cervical incompetence. Miraciously they performed an emergency cerclage to keep baby B. And I am now 26 weeks and on strict bedrest hoping for a healthy term delivery. It hurts so bad to lose a baby like this. Make sure you ask lots of questions And demand a transvaginal ultrasound to check cervical length. Amazing I got pregnant again right after my son passed. My high-risk OB Dr. recommends a cervical cerclage to keep my cervix closed. I’m praying I can make it to at least 35 weeks this time. i know what you guys whent threw i was 22 weeks when i lost my second child. They do not know why but it broke my heart. i WHENT IN TO LABOR JAN 26 2008. i was in labor for 2 1/2 houres with him and he lived for 2 1/2 houres after birth. amazingly im pregnant now a year after and im 33 weeks they are trying every thing they can to keep this one. I hope they can atleast get him to 36 weeks. and only reason why is because iv been in labor for 3 days. so please be care full of what you do when your pregnant. I had my twin girls at 24wks 1day due to an incompetent cervix. It was my first pregnancy and I had no idea that this could even happen. They still cannot explain why it happened. I was in labour for only 1/2 hr by the time my cervix was fully dilated, luckily enough I was at the hospital and they injected me with steriods and it held the labour off for another 3days, but after that both my first little girl Isabelle and I caught an ecoli infection due to the birth canal being open and vulnerable. Isabelle died 9 days later of complications from the infection, but Aine lived and grew. We were in hospital for 4months and almost died 5 times. But she is now 17months old and absolutely perfect, there is not a thing wrong with her. She is walking and talking and the cutest toddler ever. I cannot thank the doctors and nurses enough for all their efforts and love over those 4 months. All I can say is if you are worried about this condition, get your cervix checked regularly, don’t wait for the doctors to tell you to do it, just demand it. It’s your body and your baby and you only get one shot at giving your bubbs the best possible chance at life. I just lost my baby boy last night at 17 weeks 3 days. I had no prior pain/cramping or spotting/bleeding. I just went to the bathroom and heard and felt a pop. I was then rushed to the hospital and delievered my baby. He never took a breath. They say that they think it is due to an incompetent cervix, and I just hope I can have another successful pregnancy. I also have PCOS and it took me four years, one of which I was on metformin to stimulate ovulation, to get pregnant. The odds are stacked high against me, and it breaks my heart to think I was so close to finally having the baby we’ve wanted for so long. My prayers are with all of you. Chenelle – I also lost my baby boy on July 14th, 2009 due to an incompetent cervix. I was 23 w 5 days. I hope your second pregnancy went well. We recently had a healthy baby girl and they now say that the incompetent cervix diagnosis was incorrect since I made it to full term without a cerclage. Best wishes to you! im 20weeks pregnant of a twins. i just found out that my cervic was open already after visiting my dr…im so afraid…the dr as ask me to have a bedrest. im praying that i may be able to deliver in thier 36weeks…GOD HELP US!